Digital Artist Josh Robinson: Hide yo kids, hide yo wife. It's Freddy 4 fingers! Oh no he d'ent! Hide yo kids, hide yo wife. It's Freddy 4 fingers! Oh no he d'ent! can you cut into something so much until it break apart like cutting those fingers apart or do you do that in another app/when you would retopo it in a production? If you use 3D Coat or Sculptris to do Voxel Sculpting that sort of thing is possible. 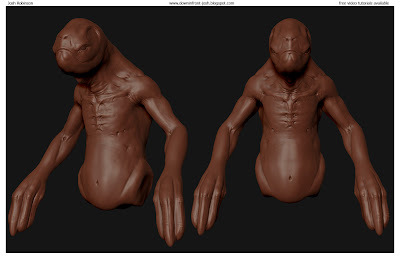 In Zbrush (traditional sculpting) you would have to re-topo the fingers and separate them at that time. Very nice, and the title was pretty sweet, too!